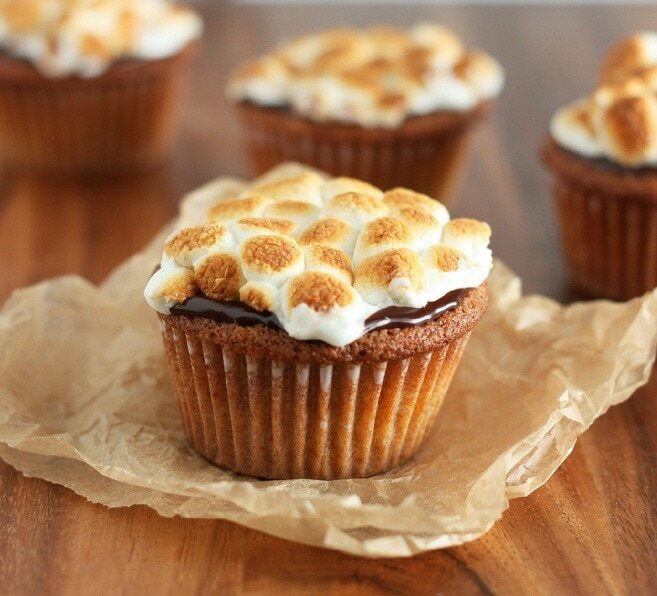 S’mores Cupcakes! Winters is still lounging upon us, not yet ready to take it’s summer vacation, therefor I can’t get out yet to enjoy a nice toasty campfire to build my favorite S’more. Time to improvise. 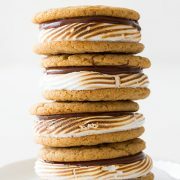 In my opinion these are closest to a real S’more as any baked good can get. 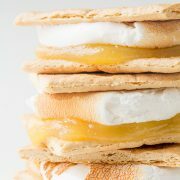 It uses real marshmallows, I opted out of doing the marshmallow fluff method (the original recipe calls for) because how often do you make a S’more over a campfire with fluff? Good luck with that if you do =). Also, this method is much simpler than making your own marshmallow fluff. As far as the graham cracker of this S’more Cupcake goes, you will notice the recipe calls for graham flour. This is an ingredient not found in your typical household, but it’s an essential ingredient to this recipe because it gives the cupcakes that delicious, authentic graham cracker flavor. It is an interesting ingredient that’s very similar to wheat flour but the grinding process of the flours is different. You can find it in the health foods section of the grocer and if you can’t find it there you can purchase it online here. One of best part of these delightful cupcakes are, of course, the chocolate! I’ve made these cupcakes twice, once as the fully original recipe and once this way with a thicker ganache and using marshmallows rather than fluff. I wanted something simpler and also I like to post recipes that don’t require fancy kitchen tools, like a kitchen torch (because not very many kitchens have those). If you’d like to stick with the original recipe, using homemade marshmallow fluff and chocolate ganache glaze you can find the fully original recipe on a blog post here. I also split the cupcake recipe in half because a dozen is enough for my small family. Pretend it’s summer, as I did, by making these. Then sit back on your comfy sofa and dive into one these authentic S’mores tasting Cupcakes while avoiding that potent campfire smoke =). 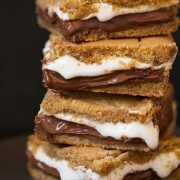 If you love S’mores you may also like to try my incredibly easy, super quick S’mores Bites. 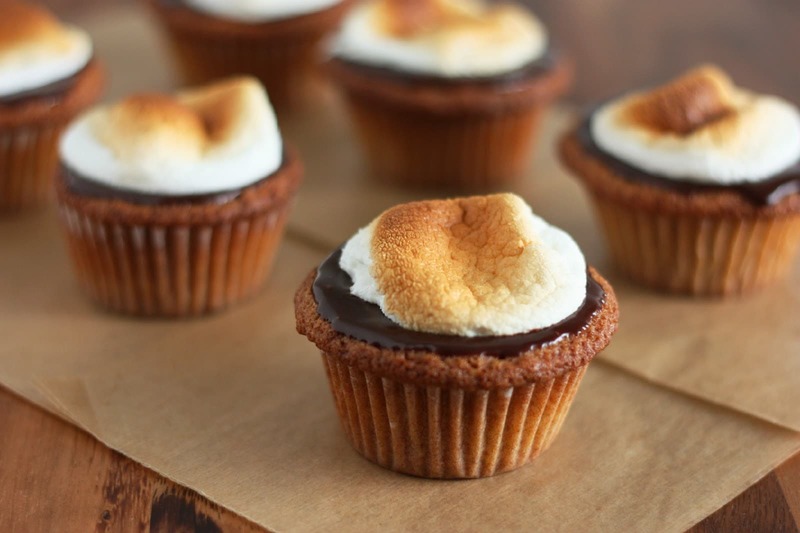 All the flavors of a s'more in a delectable cupcake form! Preheat oven to 350 degrees. In a mixing bowl, whisk together all purpose flour, graham flour, baking powder, salt and cinnamon, set aside. In a separate mixing bowl, using an electric mixer, whip together butter, brown sugar and honey until pale and fluffy. Stir in eggs and vanilla extract, scraping down the sides of bowl as needed. Add in dry ingredients and mix just until combine. Divide batter evenly among 12 paper lined muffin cups, each cup should be about 2/3 full. Bake in preheated oven 21 - 24 minutes until toothpick inserted into center comes out with a few moist crumbs attached. Allow muffins to cool completely. Spread about 2 1/2 tsp thick chocolate ganache over each cooled cupcake (note: I have made these muffins twice and both times about 1 tsp of the center of the cupcake didn't rise level with the rest but it turned out it worked perfectly to have a ganache filled center, if yours do rise level then cut a small hole in the center of each cupcake about the size of a teaspoon to fill with ganache). Place oven rack two levels below oven broiler and preheat oven to low-broil. Generously butter a cookie sheet as well as a silicon or rubber spatula, set spatula aside. Spread miniature marshmallows in an single layer close together, in the center of the cookie sheet (if using 12 large marshmallows align in a single layer several inches apart from each other so they don't stick together). Place marshmallow lined cookie sheet in oven, DON'T WALK AWAY, and toast marshmallows until golden rotating pan as needed to evenly toast marshmallows (this may take only a few seconds - 30 seconds so watch them closely the entire time). Once golden, immediately remove from oven and using buttered spatula scoop up small bunches of marshmallows at a time and lift onto ganache covered cupcakes (if using 12 large marshmallows just scoop and place 1 large marshmallow on each cupcake). Store cupcakes in an airtight container. Combine chocolate chips and heavy cream in a microwave safe bowl, microwave on 50% power in 30 second intervals, stirring after each interval until melted and smooth. Recipe Source: cupcake recipe adapted from Martha Stewart's Cupcakes, page 151.